The Hill End and Tambaroora Gathering Group is a group of like-minded people who share an interest in the descendants of families of Hill End and Tambaroora in central western NSW. Early in the 1930s a group of women and children started to meet regularly in the Royal Botanic Gardens in Sydney. 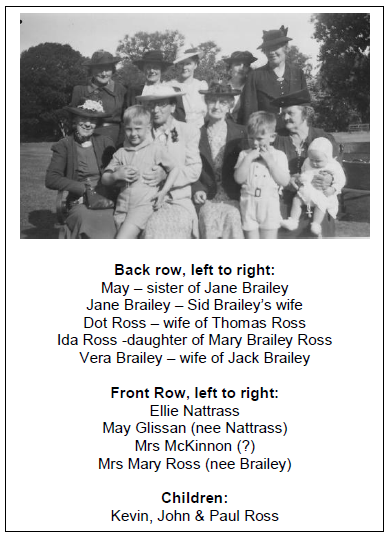 These were the families of ex residents of the Hill End and Tambaroora goldfields and amongst them were members of the Ross and Brailey families. Since leaving the goldfields they had been missing the closeness and companionship of village life and these meetings went some way towards restoring the support networks that had formerly existed. Before long the male members of the families realized just what they were missing and were very happy to join in and meet their old friends and relatives and to once more enjoy the contact. Soon it became necessary to send out a letter to those who wished to attend giving the date of the next “Gathering” as it became known. In the early days Rita Walpole typed and sent out these letters. Then, others took on the task and subsequently Ellen (Ellie) Parkes carried it on for many years. When Ellie passed away in 1973 Bill and Betty Maris were asked if they would like to keep on with this project. They accepted the challenge and were delighted to do so. They had been attending the “Gatherings” for many years, in fact, Bill recalls attending with his father when he was still at school. Over the years they collected family history information and memorabilia and became the unofficial experts on all matters relating to life in the area. They sent out a newsletter for 32 years giving news of the village and often included copies of old photographs and the date of the next “Gathering”. During the afternoon, at the 2003 “Gathering”, a small group were discussing the fact that many of the older generation who had the knowledge and insight into the vital history of the Hill End and Tambaroora goldfields were no longer with us. It was recognized that something tangible should be produced to record the history of these families before all of them had passed on. To this end a small group of volunteers, led by Lorraine Purcell, collected and compiled this information and in 2006 the “Hill End and Tambaroora Pioneer Register” was published. It covered around 600 families from the area and information was supplied by 250 contributors. The group has now received a new lease of life with the influx of a fresh generation of descendants, those who are interested in tracing their family history in the area. The advent of the Internet has made the world a much smaller place and interest in the Register has encouraged researchers to attend the annual “Gathering”. As well as a maintaining the links of the original families, it has evolved into a meeting place for those with connections to the district to join in and share their experiences and family history research. 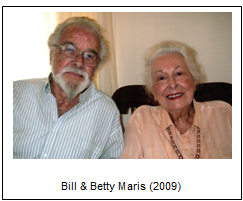 In 2006 Bill and Betty Maris handed over the reins of the Group to Lorraine Purcell. When Betty passed away in April 2016 she left us a wonderful legacy of stories and research spanning more than 70 years. Bill’s passion for Hill End was infectious and he and Betty had so many wonderful memories and stories about their visits there. They spent many happy times in their cottage in Fletcher St, talking with the locals and collecting their stories and family histories. Bill passed away peacefully in August 2017 and right to the end, he was always keen to hear of the Group’s activities in town and expected a full report after any event. He was a willing mentor and his encouragement and interest was heartening. Lorraine’s interest in Hill End arose many years ago when she used to go camping and fossicking there, little realizing that her great great great grandmother, Ellen Gaynon was actually buried in the local Catholic Cemetery. When she started doing her family history in the mid-1990s she established that her ancestors were indeed early arrivals on the Hill End goldfields. She attended the Gathering in the Royal Botanic Gardens in the hope of finding other descendants of her Gaynon and Fitzgerald families. Lorraine is a retired librarian with a strong interest in Australian history and is very keen to see the preservation of history and research for future generations. The Group still collects and actively seeks information and memorabilia on Hill End and Tambaroora for their publications and dissemination. It has become a conduit for connecting families who are researching the same families. The Newsletter is now sent out twice a year, and the annual reunion is held at Rhodes Park in Sydney on the first Saturday in March. Reunions have also been held every few years in Hill End as well. The Gathering Group also works closely with Daphne Shead of Hill End Family History, a local volunteer organization located in Hill End, with similar goals and objectives. Our small but active band of volunteers have undertaken the research and work for this website and it is a tribute to their hard work that this material is now available.